Let’s start with something that is of critical importance, but very embarrassing to admit: I was surprised that the realities of racism, sexism, heterosexism, and classism exist in academia, just like the rest of society. I can recall instances of prejudice, discrimination, invisibility, tokenism, invalidation, and so forth within the walls of the ivory tower that are very similar to those I experience outside of it. Just as higher education as an institution is not immune to prejudice and discrimination, neither are academics. The extremely embarrassing part of this self-disclosure is that I continue to be surprised with every new encounter of stereotypes, hostility, denials of opportunity, and so forth. I suppose my blessing is also my curse: seeing the potential for good, kindness, and justice in all people. 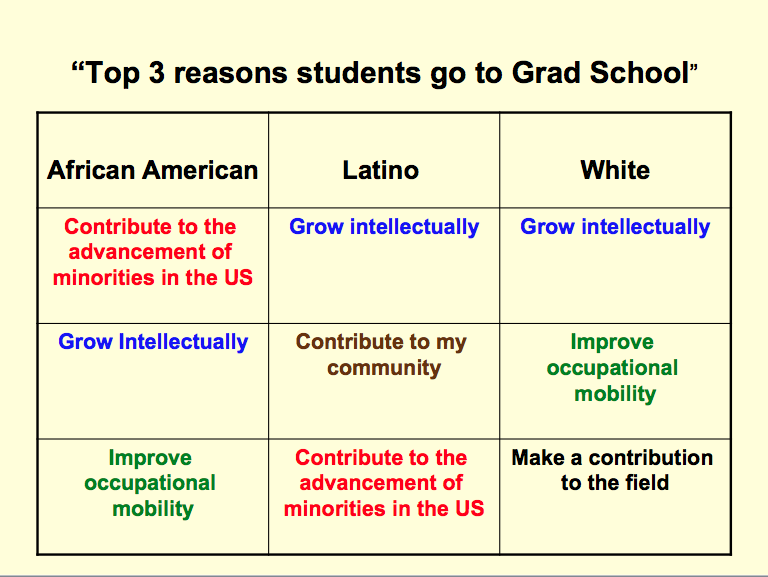 Top 3 reasons students go to Grad School: [African Americans] 1) Contribute to advancement of minorities, 2) grow intellectually, 3) improve occupational mobility; [Latina/os] 1) Grow intellectually, 2) contribute to my community, 3) contribute to advancement of minorities; [whites] 1) Grow intellectually, 2) improve occupational mobility, 3) make a contribute to the field. Notice overlap in wanting to grow intellectually, but contributing to social change and social justice is top 3 priority for whites to attend graduate school. White students are least likely of the three groups to consider the racial and ethnic diversity of a PhD program when considering where to go for graduate school. Black and Latina/o students are more likely than whites to note an advantage for white students in their department; whites are more likely than students of color to perceive an advantage for people of color in their department. (It’s striking that even among sociologists, some whites believe that there are advantages afforded to people of color!) These two sets of perceived inequality predict less satisfaction with the climate among fellow PhD students. Though the placement differs slightly, all three racial and ethnic groups note wanting to grow intellectually. That makes sense. It would seem strange to embark on an intense educational training for 4-8 years (sometimes more) simply to advance one’s job prospects. But, that is a reasonable priority, hence whites’ and Blacks’ mention of improving their occupational mobility (e.g., getting a better job). But, what stands out most to me is that the #1 reason for Blacks to pursue a PhD in sociology is to contribute to the advancement of racial minorities, and reasons #2 and #3 for Latina/os are similar (minority advancement AND to contribute to one’s community). Instead of a similar or parallel reason, a desire to contribute to the field of sociology ranks as the #3 reason for whites to attend graduate school. Let me say up front that the reasons offered are all important and noble. I don’t mean to suggest that any of these reasons are bad or selfish. But, what I wish to illuminate is that whites in sociology and, arguably even more so in other disciplines, may not list as a top career priority to contribute to the advancement of racial and ethnic minorities. This means that Black and Latina/o sociologists work with, and are even trained by, white sociologists who may not be interested in the same goals of racial equality and social justice more broadly. You don’t have to worry that I’ve prepared a case for radically altering the academy, or restructuring graduate training programs. I realize that this is only one survey, and it may not accurately reflect the experiences of every student of every race and ethnicity in every academic program. But, it does offer a sense that I am not alone in my experiences as a PhD student of color. One further concern that causes me to hesitate in my read of this survey is that other dimensions of difference and inequality — namely gender, social class, and sexual orientation — were not considered. As a group whites may not rank a commitment to racial justice as a top reason for pursuing a PhD in sociology. However, we don’t know how many white women, working-class whites, and white lesbian, gay, bisexual, and transgender (LGBT) people have pursued or are pursuing PhDs in sociology, women’s studies, ethnic studies, LGBT/sexuality studies, and so forth with the intention of fighting sexism, heterosexism, and classism in society. This entry was posted in Academia, Scholars of Color and tagged privilege, sexism. Bookmark the permalink.